This is probably not a book I would typically pick up as I don’t read a lot of suspense/police fiction, but when I saw it dealt with the subject of human-trafficking, I was interested because that is a matter that has caught my attention and pulled at my heart. 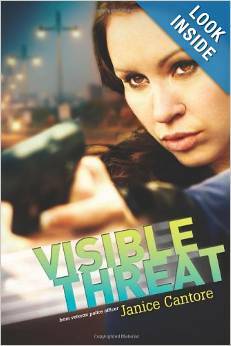 I was pleasantly engrossed into “Visible Threat” immediately. I very much appreciate that the author is a former police officer therefore giving authenticity to her writing. It was very real, and well-written. The characters were very life-like, and I liked Brinna a lot and could identify with her on many levels. That aside, this book was amazing, and gripping. I really enjoyed it! I don’t even know how to touch on the whole human-trafficking thing in this review, but trust me when I say it was written with care and strength. The whole matter is close to my heart, one I want to get involved with to help end. Elohim (God) is bigger than even this, and will perform His perfect justice in His perfect timing. I very much like that Brinna was searching for her own faith throughout the book, and dealt with the hard questions of why bad things happen, where is the justice, etc. Note: I received this book free for review from Tyndale House publishers. I was not paid to review this book, and all thoughts are my own and unbiased. Are you struggling to find your purpose in life? Are you in a relationship that you feel is pulling you away from God? Are there no “options” in sight, and you are starting to fear that God may have forgotten about your heart and your dreams? 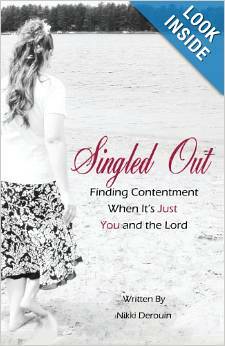 Singled Out was written with the sincere desire of encouraging you in your walk with the Lord, motivating you to search your heart, and challenging you to wholeheartedly commit your life to Him! Remember, regardless of our relationship status, we must be single-hearted in our service to Christ — our Savior and our First Love. Well, as above mentioned, I did not finish this book. I am just not in a spot in my life right now where I could focus on it. I requested this book mainly for the purpose to review it for friends who like these type of books, and I had hoped to give a helpful review. But to be honest, this type of book is not my “style”, and I have a hard time reading them just because they don’t really minister me. I don’t want to give an unfair review just because I don’t really get into these books that help with ‘contentment while being single’ – I am sure this book could do a lot of good in young ladies lives, and be helpful. I got about half way in the book; some of the things the author spoke of were good, however I did notice that she was kind of ‘promoting’ finding “ourselves”, but didn’t continue on the importance of finding ourselves in Christ, which I think is so important – everyone needs to know and understand who they are in Christ first and foremost before worrying about finding their spouses. Like I said, you may find this book very helpful. It is pretty short, and therefore a pretty easy read. It’s sort of along the same lines as “Before You Find Prince Charming” by Sarah Mally. How to use the time of singleness before marriage for God. Things I am extremely excited for! 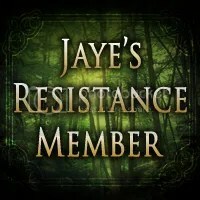 I am actually doing a regular post! :D Though it does involve a book…how could it not? There are some things I am super excited for. I shall list them. First and foremost, I am most excited about…….. EEEEEEEeeee!! 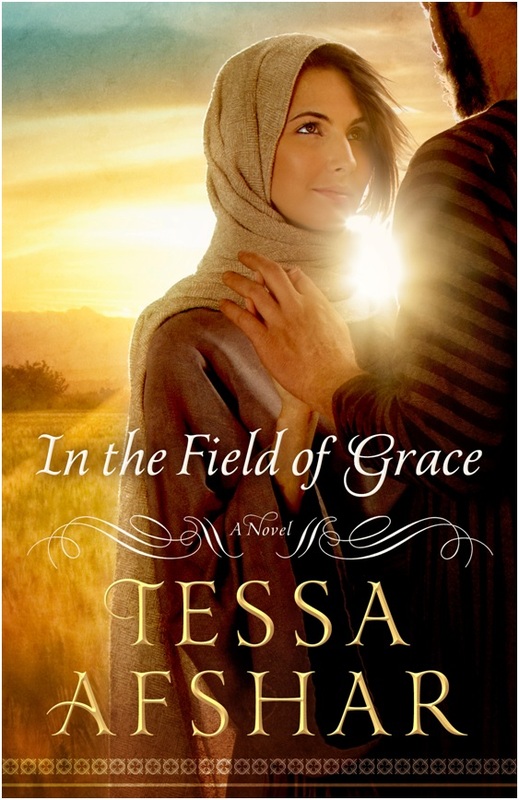 Tessa Afshar’s new book, “In the Field of Grace”!!!!!!!!!!!! I couldn’t add enough exclamation marks. When I think about the book, I will get giddy with excitement, and maybe scream about it a bit. “In the Field of Grace” releases on July 1st, 2014. All of Tessa Afshar’s books have made an impact on me – from her first, “Pearl in the Sand” (which is linked to this newest book of hers!) to the two Harvest books = “Harvest of Rubies” and “Harvest of Gold”! I have no doubt “In the Field of Grace” will do the same. Which releases June 13th! I know I did already mention in a previous post my excitement for this, but thought I’d do it again. :D Especially since there’s a date now. 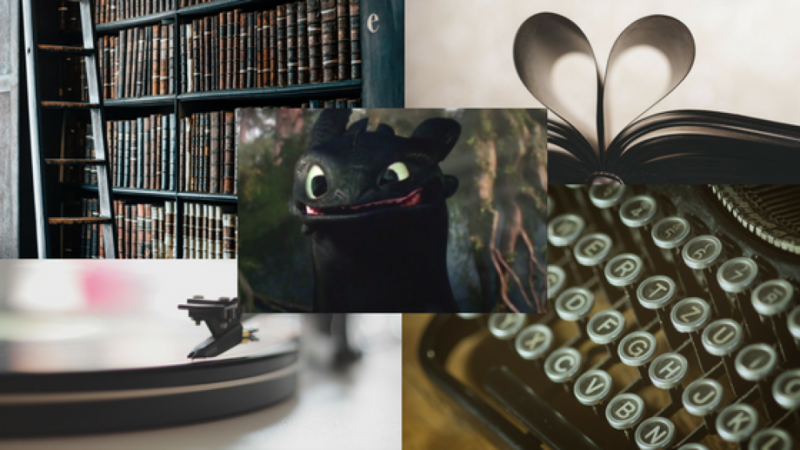 I am hoping the second “How to Train Your Dragon” is as good as the first. We’ll see! Which comes out on DVD this Tuesday – the 18th. I’ve heard tons about it and seen a bazillion pins from it on Pinterest, so I’m eager to see it for myself! And I think I shall end this post here. What are you looking forward to? I have a review that I should have posted a while ago (after I finished the book, perhaps…!) but never did. 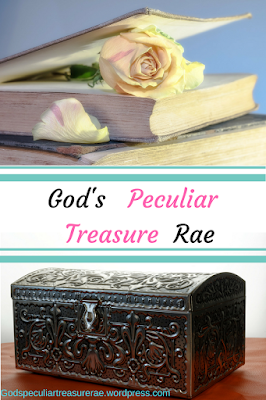 I reviewed this book of my own choice – it is not a review book (but I do now own it!! So excited about that). This book was excellent, such as the second book in this series was. “The Well” brought you through so much from beginning to end. It is bright and vivid of a story, written with skill from the Great I Am. I do so love books like that! This book had my heart pumping many a time, and I had a hard time putting it down once I picked it up. The entire story-line was so well done, and kept you thoroughly entertained and captivated. There were sad parts that had you aching alongside the characters, but there were also many parts where you were glad with them as well. The ending is definitely bittersweet. I loved it, and it hurt all at the same time. Maybe I loved it more because from the beginning I loved one of the more ‘side-characters’ Enosh. But yes, the ending was hard for me to read at points because you wanted something different at first. But as it continued, I found this was the perfect ending, bittersweet as it may be. One thing I wished though, was that Mara could have been justified at the end, but I also think it works into the lesson that it only matters that God is our Perfect Justice. That we mustn’t seek revenge and even justification for our own needs, but rather we need to leave it in the Almighty’s hands. I will be honest and say I didn’t necessarily care for the epilogue, for various reasons. Not that it was bad in any way, I just didn’t care for the ending of it (the last paragraph or less, of the epilogue). But still, this is an excellent book and well worth five stars! Mrs. Landsem writes so carefully, creatively and excellently! A little note to the effect of it being part of a series: Yes, these books are better read when read in order, but it is not an absolute must. Reading them differently will just cause some ‘Oooh! I remember that in the second book!’ (if you read the second book before the first, like I did! 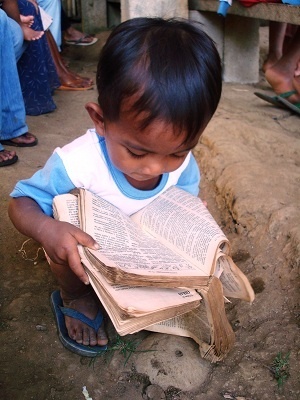 ), but won’t really hinder the enjoyment of reading. One is too many lives to be lost. But in South Asia, 50,000 female children are aborted every month. 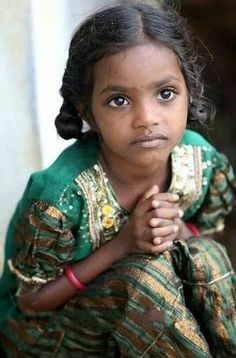 Gospel for Asia (http://www.gfa.org/imagine-if/too-bad-im-a-girl/) says: If they live to take their first breath, they grow up being the last to eat and the most likely to be illiterate, and often they are sold into bonded labor or prostitution to provide for their families. This information makes my heart hurt, my tears fall, and my anger stirred. It isn’t fair, and I want to do something about it. I want it to be changed. I want those girls to live and know they are loved by their Abba Father in heaven, by our great Elohim. To live and know they are cherished. I want to cherish them. I want to tell them they’re loved and hug them and show them their worth. I don’t want them to have to go through the pain and heartbreak that they do. I know I have so much more preparing to go through yet, but my heart still aches, and I still wait. I wish I could stop even one more abortion before it happens. 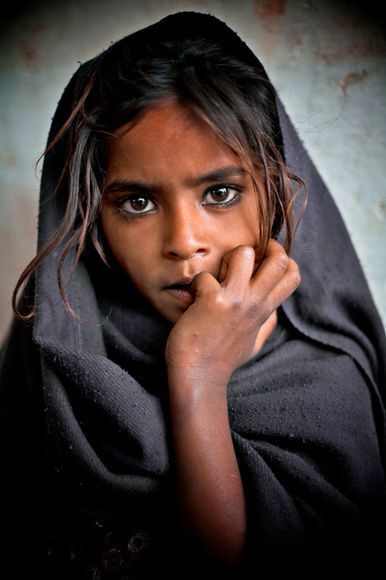 One more orphaned child. One more life. Because one life is always worth it all.